Prepare Your Import Export Business For Brexit, Hard or Soft. UK import and export businesses need to know how to prepare for Brexit, urgently. At this stage, we had hoped to know much more detail on how the UK is going to exit the EU but still, no one quite knows where we will be on the 29th March. Call it what you will but the one thing we do know is, that without a deal, trade with the EU will bring about very major adverse changes. UK traders will of course, want and need to continue trading with their established EU partners and EU traders will want to strengthen trading ties with their UK counterparts. Until now, inter EU trading has been a very easy process, with minimal customs involvement, open borders, unimpeded deliveries, largely paperless and declaration of VAT post delivery just to mention some of the advantages we had as a member of the EU. This could be about to completely change. With a hard Brexit, this frictionless trading will come to an end and as we’ve been seeing on the news, the UK will be thrown into the world of International Trade, with all its impositions, rules and regulations trading under WTO rules and tariffs. Our EU trading partners will have the same status as any of our other international trading partners outside the EU such as Russia and will have to follow the same customs procedures such as declaration on the new CDS system, which is replacing the old CHIEF system. This means that consignments will need to be given specific statuses of route 1, 2, 3, or 6, all of which are time consuming. This could cause severe delays at the UK border for EU member consignments, with some predicting up to six hours. What Could Be The Impacts Of Brexit At Customs? Again, right now, no one knows for certain what the full impact of Brexit will be but without a deal, something that is looking increasingly likely and only 6 weeks away, we’re highlighting some the unknowns that should be considered for your import export business. The impact of Brexit on international customs and trade compliance is not yet clear but the following factors are something that must be considered at this stage. What will happen without an agreement? …without customs clearance and duties to be paid. This would change over night. Those movements will become third-country imports or exports, including the need for customs declarations and duties due to a missing agreement. Export control regulations will be affected as well. Just two minutes more for customs inspections per truck, could result in approximately 27 extra kilometers of traffic jams with an obviously massive impact on the supply chain. Additional custom specialists will be required. The administrative burden could increase from five minutes before Brexit to more than one hour of workload per export! 185,000 UK traders could be making their customs declarations for the first time. This is not going to be a smooth or streamlined process so you must know how to make a customs deceleration if you are going to prepare your business for Brexit. Customs declarations in the UK are expected to increase from 55,000,000 to 255,000,000 per year. It could be very, very costly, with an estimated €50 or more per declaration. The OECD estimates that inefficiencies relating simply to the process of customs clearance could result in additional costs of up to 10% of the value of the goods. Beyond this, increased duty rates on imports to the UK, from non-EU countries due to the UK losing access to EU free trade agreements will apply. New free trade agreements need to be negotiated with all relevant countries which could take 5 to 7 years per free trade agreement as they have done with several countries already. Will the new customs authority system CTS be ready? Will support systems be ready? Will there be enough capacity and customs brokers? Will the companies export control management be ready? There are many questions to be answered but it is important to understand what is at stake and how your business will be affected. 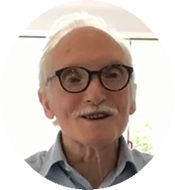 Take the time now to understand how Brexit could directly effect you and research what changes you need to make, so you are not caught out and your business does not suffer come March 2019. As a business owner, you should really at this know how to prepare your business for Brexit and grasp this as a great opportunity to become part of a global explosion in trade. UK businesses must identify how international trade post Brexit will affect their trading position within the EU and beyond and be prepared to meet the new challenges. The following are a set of questions that is advisable to ask yourself and research, pre-Brexit. Be proactive, no reactive and prepare for a worst case scenario and how a hard Brexit will effect you. Waiting for the 29th March 2019 may well be too late. 1. Understand how to export. How will the new import export regulations impact upon my business? 2. Will I have to change my Terms of Delivery (Incoterms 2010)? 3. Will I now have to employ the services of a freight forwarder or clearing agent and at what additional cost? 4. Does my company have the necessary import export training to work alongside the new rules and regulations? 5. Am I registered for EORI status (see below for more information on this)? 6. Do my goods attract an import export licence? 7. Can I identify a customs regime which may help me reduce my import costs? 8. How will VAT be collected on inter EU trade (see below for more information on this)? 9. Do I understand the new Customs Declaration System CDS for imports and exports? 10. Can I provide the relevant information for inputs into CDS (i.e. new tariff changes as introduced in Volume 3 of the Tariff Book)? 11. Have I subscribed to the Government Gateway Account (See below on how to do this)? 12. Will my existing supply chain timing be affected? What adjustments do I have to make to counter any extra delays? 13. Will I have to make changes my company terms and conditions? 14. Will Post Brexit rules affect my competitive edge? If so how can I retain my competitive edge? 15. Will my existing EU customers impose a different method of payment other than the one currently in use? 16. Do I fully understand the methods of payment associated with International Trade (ie. Letters of Credit, CAD, Bills of Exchange)? 17. Have I arranged for an AWARENESS COURSE for ALL members of staff to attend pre-Brexit 29th March 2019? Check out our top ten tips on on importing and exporting to get you started. Importing and exporting within the EU could be vastly different with either a Hard or Soft Brexit. With only 6 weeks left, now is the time to prepare. We address two simple action points to get you started. The Guardian has reporting that two thirds of British businesses had made no preparations at all for Brexit. I’m not aware if that figure is still the same today but if it is, it’s very unwise to be leaving your preparations this late. Should the UK does leave the EU on the 29th March 2019 without a deal, the EU as far as trade goes, will become like any other “foreign country”, take for example Venezuela. British companies will need the same documentation to trade with the EU as you would Venezuela. Currently, trading with the EU is very easy, there’s no major documentation required, no customs, any import export documentation that is required is filed remotely after the import or export is completed. That same export to France will be much harder. Be proactive, not reactive, have everything in place before the end of March. If you trade solely with the EU, you are running at this point, a very high risk of being completely caught out and your business potentially coming to a halt if you don’t know how to trade outside of the EU. If not, go and get one. If you’re trading outside the European Union already, you’ll have an EORI number, so you don’t need to worry about this. If not, depending on whether you’re registered for VAT or not and whether you’re importing or exporting, here’s how to get your EORI number. Customs Clearance will be using the new CDS system, we’re told by the end of 2018. You will need an EORI number to access this system. Delivery Times: Without a deal, delivery times of goods coming in and out of the EU will be delayed with some estimating very severe delays as shown above in our infographic. Analyse how your business will cope if this becomes a reality and goods you’re importing are held up for days before you receive them and equally, how this will effect your shipments outbound to your customers. If you’re offering guaranteed delivery times, you may well want to rethink this. Brexit Risk Assessment: Perform a risk assessment on your entire company, from the warehouse to the managing director . Where is your company vulnerable, what will need to change, where are your biggest risks and how can you minimise them? ABTS Training can help should you need it. For more information on our Brexit Breakdown membership, please feel free to contact us. 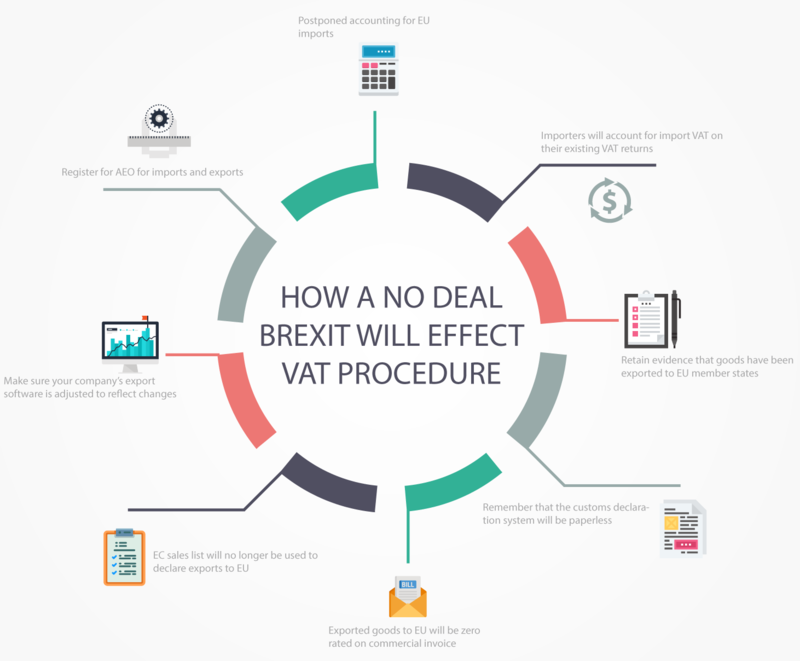 How Could A No-Deal Effect VAT Procedure? A new subscription service where we do the research, contact relevant agencies and get to the bottom line on Brexit import and export. We cut through the complicated web of information to give you need-to-know facts for your business, post Brexit, keeping you informed through webinars, videos, email alerts and printable fact sheets. See The Brexit Breakdown for more information.